Multi-award winning and multi-talented director/writer/producer Bong Joon Ho is one of the coolest South Korean filmmakers you should quickly get yourself familiar with. Below is a quick gist of his five feature works. Barking Dogs Never Bite (2000) is a dark comedy-drama about a man who is irritated by the sound of barking dogs and eventually resorts to abusing and kidnapping them. Memories of Murder (2003) dealt with a true-life serial murder case that remains unsolved till this day. Many would have seen The Host (2006), in which a mutant monster leaps out of the Han River to terrorise the city of Seoul. Inspired by a local article Bong came across about a deformed fish found in the Han River, the movie was a monster hit and sold a record 13 million tickets in its home country alone. Mother (2009) is a psychological thriller that delved into the complexity of the insane mind in which the elderly protagonist sets out to find a savage killer. And Bong’s first English-language film, Snowpiercer (2013), is a post-apocalyptic action-thriller in which a super-train holds the last human survivors of an ice-age earth. The movie appeared on many film critics’ top ten film lists of 2014. Its stars Chris Evans and Tilda Swinton also received critical acclaim for their performances. Audiences who have binged on at least one of Bong’s films will be able to attest to the freshness of his ideas and his penchant of genre mixing – where adventure, suspense, comedy and tragedy often cocktails in a single film. Well, Bong is back with another monster film, literally. A Netflix original feature, Okja revolves around a young Korean girl named Mija (newcomer Ahn Seo-hyun), who traverses from the mountains of Seoul to the concrete jungle of New York to rescue her best friend, a genetically-engineered creature named Okja who has been captured by a greedy conglomerate. This film sees Bong collaborating with Tilda Swinton for a second time, alongside regular Korean collaborators Byun Heebong and Jae Moon Yoon. Other cast members include Jake Gyllenhaal, Paul Dano, Steven Yeun, Lily Collins, Giancarlo Esposito and Choi Woo Shik. Bong co-wrote the screenplay with Jon Ronson, an investigative journalist whose book was the basis for The Men Who Stare At Goats. Prolific cinematographer Darius Khondji, whose credits include Se7en, Evita, Amour and Midnight in Paris, is the film’s Director of Photography. Brad Pitt is a co-producer, through his Plan B production house. 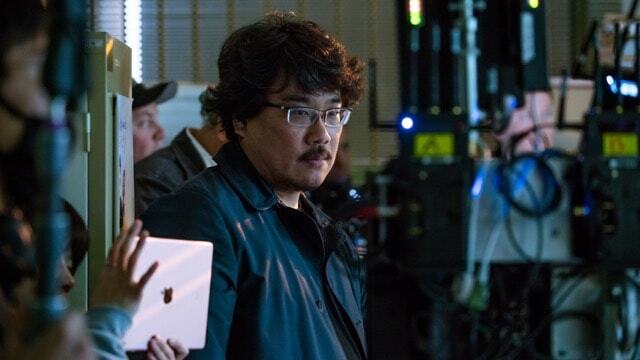 Okja was shot in Seoul, New York and Vancouver, and will be in English and Korean. F***: What does Okja mean – any significance? Bong Joon Ho: The name has no meaning; it’s just a very old-fashioned country-style female name in Korea. That’s also the case for Mija, no young female person has that name anymore. If anybody in the current generation is named Mija they’ll beg their parents to change their name. [laughs] In story terms, I believe Heebong, the grandfather in the film, probably named Okja and Mija together. I was striving for some awkward combination because the pig itself was made by a contemporary global corporation with cutting-edge technology; whereas the name itself is very old-fashioned. How was it like working with Tilda Swinton again? You might have noticed in the opening sequence of the movie that Tilda is also the co-producer. We had such fun working on Snowpiercer that we grew a special partnership. I first told her about my Okja project when we were doing a press junket for Snowpiercer, so we had a very fond time preparing it together, from the screenplay to the start of production. Tilda also introduced our American-side production designer Kevin Thompson to me as she worked with him on Michael Clayton, he was elemental in sourcing out various New York locations for Okja. Tilda even came up with many ideas for her screen image like the weird props of fake teeth and braces. She loves transforming into her characters. What inspired the creation of Okja? Every Sunday, I enjoy watching an old Korean television show called Animal Farm. The show portrays the relationships between humans and animals in their everyday lives, like a little girl cries after losing her dog. I had a lot of inspiration from this TV show and even invited the makers of this show to Okja’s premiere. Initially, while conceptualising Okja, I imagined it to be about five-story-high and stuck under this highway, which I was driving on. The essence of this animal is that despite its big size, it has such a sad face. So I began to wonder why this animal is having such a sad face, who was harming this animal, and why is it so big… The size of the animal means the value of the product, which led me to think about the corporation behind it. A lot of GM (genetically-modified) crops and animals were made to be big so they had bigger value. This movie reminds me of E.T., King Kong and some movies from Hayao Miyazaki…were they sources of inspiration? Ever since I was very young, I watch a lot of Hayao Miyazaki’s movies, it’s already in my bloodline. E.T., King Kong are also very brilliant films. As for King Kong, it is similar to Okja because the ending takes place in New York. But the more direct inspiration was George Miller’s Babe: Pig in the City (1998), if you had that in mind while watching Okja you’ll have another interesting experience. In fact, I love the sequel more than the first one. [laughs] Interestingly, I met with George Miller at Cannes and we had dinner and had a very enjoyable and interesting conversation. Okja is also the closing film for the Sydney Film Festival and George Miller will also attend. As a crazy fan of Mad Max, I’m very honored to have him there. In Okja, there is this haunting scene at the slaughterhouse that is reminiscent of Holocaust movies…was that intentional? Actually, not only at the slaughterhouse, there are two sequences: before and after the slaughterhouse where there are thousands of pigs… It was quite intentional; the image of the wire and fence to remind of Second World War concentration camps, that was the look I was going for. But for animals, that’s what they face in their everyday lives. For us humans, we just consider them as food, but from the animals’ perspective they are going through a holocaust every day. During the screenwriting process, my producer and I actually visited a huge slaughterhouse in the United States, in Colorado. They call it beef plant, they don’t like the word ‘slaughterhouse’ – “we are a very modernised plant, we are so proud of it”, kind of idea they have. I respect that but what I witnessed inside the slaughterhouse was really terrifying and overwhelming. The slaughterhouse scene in the film itself is a very mild version of what I witnessed in reality and much more overwhelming. Normal factory plants, they always assemble things, but at this slaughterhouse, they dissemble. It’s already a perfect organism, the animal, but in contrast, they dissemble every bits and pieces. So after witnessing the process, I couldn’t help but not eat meat for two months, I was forcibly converted into veganism. However, after returning to Seoul, which is a BBQ paradise, my meat consumption returned, but I try to refrain from red meat as much as I can. I am not opposed to humans eating meat, if you watch the film, you’ll notice that Mija also enjoys chicken stew. However, treating animals this way in this capitalistic factory system was a very recent endeavour that occurred. Slaughtering animals in this fashion and treating them this way, we do have to take time and be conscious of it, of what’s going on. You’ve worked with big studios and now you’re working with Netflix. Any difference? Korean companies and investors financed all my prior films and only for Snowpiercer and its distribution process did I meet with the Weinstein Company. I had an interesting experience with the eccentric character, Mr. Weinstein. I did face some difficulty but in the end it all worked out. He has his own style of distribution, I respect that, but I have my own style of filmmaking so it’s very hard to compromise. However I allowed him in the end to distribute and show the film with the director’s cut so it was a happy ending for us. As for Netflix, it was an incredibly joyful experience because not only was it a bigger budget (than Snowpiercer) which they fully funded, they also guaranteed 100 percent creative freedom. The director’s cut was guaranteed from the get-go. I believe Netflix’s support for creative is one of the biggest reasons why master filmmakers such as Martin Scorsese will begin shooting The Irishman with Netflix in August. Tell us more about the end scene… Read the full article and interviews with Okja stars Tilda Swinton, Steven Yeun and Giancarlo Esposito in the upcoming issue of F*** Magazine. Okja premieres on Netflix 11PM (SGT) tonight (June 28).